Last night, fashionable friends and family of famed Indian designer Anita Dongre packed into her serene new storefront on Broome Street. To the metronomic beat of floor-sat tabla and pantam drummers, eyes and hands darted about the space, flipping through racks and racks of covetable closet gems. 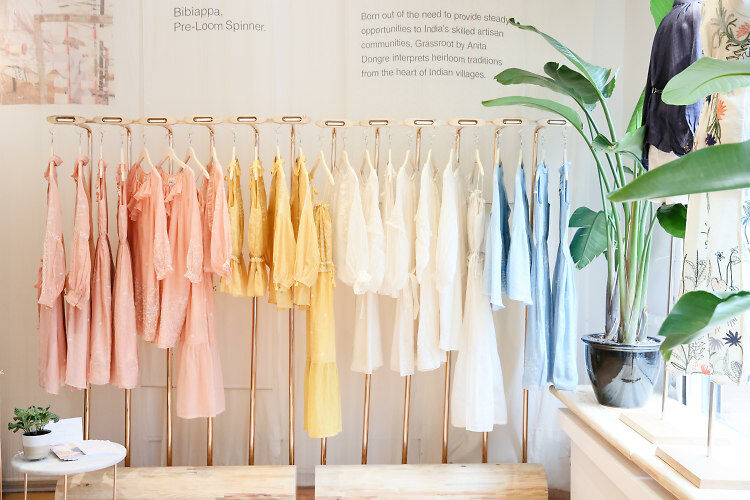 While Anita may be a style legend back in India, with her line in over 650 stores in just her home country alone, her sustainable fashion brand Grassroot's new shop marks her first foray in the US. Celebrating and combining centuries old handicraft traditions with contemporary styles, all of the boho-chic pieces are produced by Indian artisans in remote villages that keep these traditions alive. Let's just say, if you love Ulla Johnson, Isabel Marant and Zimmermann, you'll be dying over this loose-fit, softly colored, hand embroidered collection. Flip through for scenes from the party!